I listened to a broadcast of Dr Martin Luther King’s ‘I Have a Dream’ and as always was moved and uplifted. How wonderful to hear it echo down the generations and get another airing even as we teeter on the brink of conflict on a global scale. I heard a researcher say it had taken him decades to mine the many layers of meaning and wisdom in the speech. 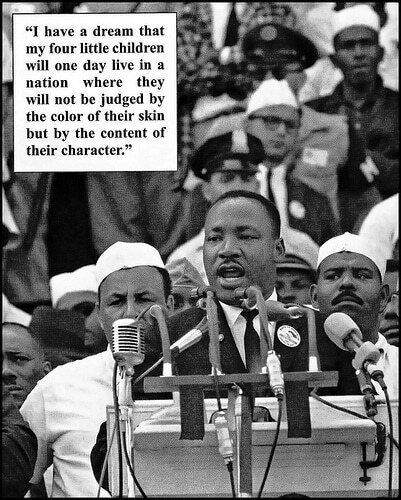 He pointed out that King said ‘I have a dream’. Not ‘I have a complaint’. I was struck by how faithfully our inner worlds are mirrored in the outer, and how we each need to do the inner work so that we can, in Ghandi’s words, ‘Be the change’ we want to see in the world. Then I caught a glimpse of my own dream. I dream of the day that all the scared little pieces of us that split away when stuff was happening that we couldn’t make sense of, come back together and know they are safe. I dream of the day that all the warring, self-critical, judgemental parts of us lay down their arms and accept, with a huge sigh of relief, that there’s nothing about us that needs to be fixed, altered or healed and there’s nothing external we need to acquire to make us complete. I dream of the day that we let go of the stories we’ve been telling ourselves and others about who we are in the world, stop pretending to be someone else and finally show up as the powerful, loving, infinitely creative Beings that we are. How about you? Will you share and inspire us with your dream? Do you have one hiding out in a complaint? We’d love to hear from you. Please share in the Comments below. Please share with your friends and contacts via the buttons below. Thank you. Ooh, love this Linda, what a wonderful way of flipping our complaint pancakes into dreams! Jo recently posted…Scared of public speaking? Here’s how I did it. Lovely dream, Jo. Your daughters are lucky girls.